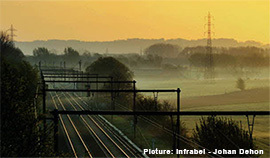 Digitalisation and security represent the next key challenges for railways. The digitalisation process is having and will have a pervasive impact on the railway sector, replacing traditional work methods with new ones and paving the way for completely new services. The wider availability of networked, distributed applications and the Cloud approach can in parallel bring to increased dependability on suitable and updated security technologies and solutions. The workshop intends to analyse these two aspects at their state-of-art and at the same time investigate possible strategies for the future.